Well, I've finally made it. 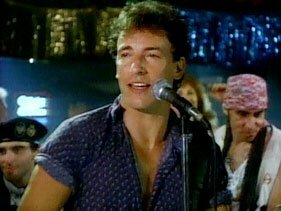 I'm now old enough to dance around and sing along to Bruce Springsteen's Glory Days and have it all actually make a little more sense in my life. I mean, I'm not thinking about a girl I used to know, I am a happily married woman, and I had absolutely nothing to do with Baseball (except one time when I was in grade school, I was gonna try out for the Baseball team, I have no idea who's idea that was, but me and two of my Barrelassin cousins were gonna do it, so all of our mothers bought us matching jersey type shirts, balls, bats, and gloves so we could practice at home first. I recall the day I was gonna tie my shoe and as I stood up, I got nailed in the head with the bat as my cousin proceeded to hit the ball. I lived. But it was all just a stupid, stupid idea.) Anyway, the point is, I've always liked that song, and I used to sing it so proudly, even though, I was just a kid, and had yet to experience the glory days that Bruce sings about. I hadn't even been to high school yet, but now that I have, and my glory days are slightly different than the ones Bruce sings about, I at least have enough days behind me now to reflect on some of my very own glory days.